Toronto is feeling very wintery these days. We were so lucky to have a long, gentle Autumn, some November and December days when we didn’t need our deep Winter parkas, but now it feels like we have settled into the season. It is funny to think that we don’t actually mark the official beginning of Winter until December 21, the day of the Winter Solstice. The Winter Solstice is the shortest day, and the longest night, of the year. What does that make you feel, when I say it is the longest night of the year? Take a moment…do you feel excited, fearful, peaceful? The Winter Solstice gives us the opportunity to go into the darkness, to be cradled and supported by it, to hear the messages that it has for us, and then to celebrate the return of the light. The High Priestess is the keeper of the Mysteries, she is the divine feminine, the Goddess. She is completely in tune with her intuition, and her inner voice speaks clearly. She has all the wisdom and knowledge in the world, but she doesn’t share it lightly. The Hermit is also a wise figure. He is solitary, not lonely. He studies and looks within himself to find the knowledge he needs, and then he shares it with those who seek it. The lamp he holds shines out to the world, as a beacon and guide. 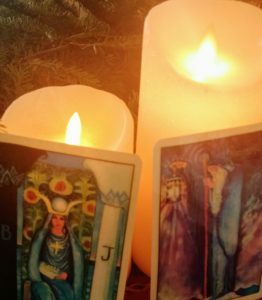 On the occasion of the Solstice, these cards say to me that it is important to find some quiet time for yourself to look within, to reflect on the year that has passed, to acknowledge what has been lost and learned. And, when you are ready, to join with friends and family and share what you have felt and learned, to celebrate the start of a new cycle. The Solstice is a natural time for introspection, but we don’t need to get lost in our own inner world. On the longest night, spend some time in the dark. Be open to the messages that your deepest self has for you. And when you are ready, light a candle and joyfully celebrate the return of the Light. 2017: What’s Your Tarot Year Card?